What was the other 99% that PARC didn't show to Apple? The irony was that when they left we still had shown the like only 1% of what PARC was doing but it was enough that they got really excited and decided they were going to retarget the Lisa to be something like what they had seen, in terms of GUI. Has anyone written or summarized about the other 99%? Even Steve Jobs himself mentioned that they had a whole lot of other stuff going on at PARC, but he got so excited about the GUI that he ignored everything else. I had three or four people (at Apple) who kept bugging that I get my rear over to Xerox PARC and see what they are doing. And, so I finally did. I went over there. And they were very kind. They showed me what they are working on. And they showed me really three things. But I was so blinded by the first one that I didn’t even really see the other two. One of the things they showed me was object oriented programming – they showed me that but I didn’t even see that. The other one they showed me was a networked computer system…I didn’t even see that. I was so blinded by the first thing they showed me, which was the graphical user interface. I thought it was the best thing I’d ever seen in my life. 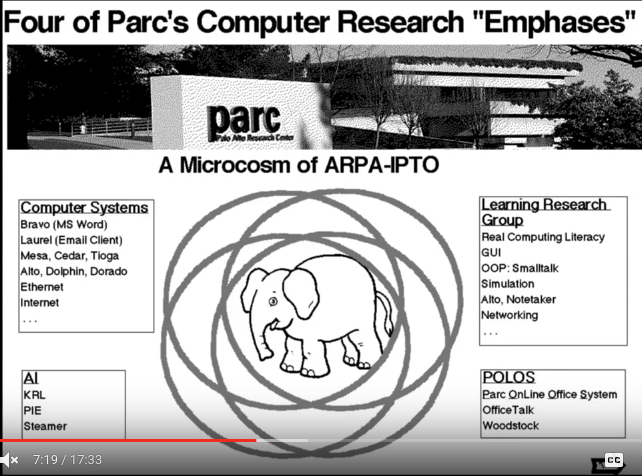 You can see a list of some of the other stuff PARC was working on here. I think the only thing of layman significance the Jobs didn't mention is probably the Laser Printer. But with all this stuff, the GUI used by their experimental computers was kind of a small thing. To them at least. Not the answer you're looking for? Browse other questions tagged technology computers or ask your own question. When did commercial studio photography become common? what city was unix invented in? Other possible inventors of the Transistor? Why was Apple not able to compete with Microsoft in the home PC market? Why didn't the Incan Empire use iron? What is the origin of the term “Developer” in the context of software? Was Donald Knuth the first person to typeset a book using a computer?